Cornwall: Cornish properties perfect for a Christmas gathering! The festive season countdown has begun in earnest, with preparations for the all important Christmas dinner, the tree to purchase and guests to accommodate. If you dream of more space in the kitchen to cook up a culinary storm, a suitable place for the tree or additional accommodation for friends and family, our properties perfect for Christmas could tempt you to bring in the festive cheer in a new home next year! Contact us for more details of these properties, or to find out how we can successfully sell your home: 01872 261160 or send an email to our Truro office. Carne Manor dating from the 14th Century is an outstanding moorland home uniquely featuring an 8’ high 360° walled garden. 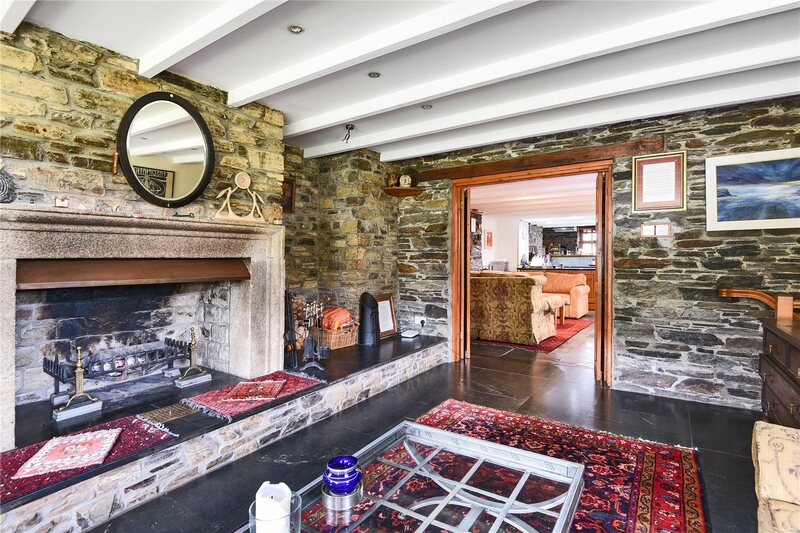 The property has granite walls, staircases, doorways and mullion windows creating beautiful external elevations, beneath a pitched roof with natural slate cladding and an interior with a wealth of period character. Guide Price £1,250,000. ​​​​​Fit the whole family in for a festive dinner! There are three reception rooms and on the side a large and sheltered conservatory, with an oil-fired stove, creating extra living space. Carne Manor's fireplace is one of the oldest in Cornwall! On the first floor there are four bedrooms with a bathroom and shower room. A cottage provides an additional three bedrooms. An imposing period residency with fantastic family accommodation set in 13.4 acres and enjoying a quiet secluded location surrounded by mature woodland and fields. Guide Price £1,185,000. There are three further reception rooms on the ground floor that provide excellent space to entertain. The current owners have carried out a series of improvements to the property. These include a new kitchen with a four-door oven Redmyre Range. On the first floor there are five bedrooms (one en-suite), a family bathroom and a study. Attached on the north east corner of the property is a self-contained two bedroom cottage/annexe which offers excellent overspill accommodation or a rental opportunity. This superb Georgian Grade II listed property offers the benefit of generating some extra income. The house is split into two separate accommodations. The lower ground floor contains a large semi open living space which includes a spacious kitchen/dining area with a grand fire place that opens out onto the sitting room. The ground floor is home to a good size family home with lots of character, with three good sized bedrooms with two of them having a superb outlook onto the garden.